It’s been a while since I’ve posted, and that’s for a couple reasons. The first, I’ve been really super busy. Second, sometimes words seem inadequate to express my thoughts on certain things, generally politically. But, there are just way too many things going on that I’d like to comment on, so I’m going to touch on them today. First, what seems to have become a big story: Sarah Palin vs. David Letterman. I find it ridiculous that Letterman would joke about a 14year old (and yes, it was the 14 year old daughter not the 19 year old) girl being sexually assaulted. I find it ridiculous that Letterman would joke and call Gov. Palin “slutty.” On this, I have two questions. 1. What would have been the repercussions if a conservative comedian made those kind of jokes about liberals, say Hillary and Chelsea Clinton, or the Obamas? There would have been extreme outrage. (And let me just say the jokes were distasteful, and I would think the same regardless of who the jokes were about.) However, because the jokes were about conservative Governor Sarah Palin and her family, there are just excuses being made, none of which I buy, by the way. It is absurd the extreme double standard that exists in mainstream media. Of course that is nothing new, but it’s still irritating. 2. What would Dave say if someone made jokes like that about his child or wife? Second, the elections in Iran. Initially, I favored the defeat of Ahmadinejad because I thought the contender, Mousavi, would be better on international issues. However, I don’t think there would be much difference between the two as far a international policy. However, I still think Mousavi would be great for the country because he supports more freedoms for the people of Iran, and he has a great deal of support from the citizens in Iran. And, personally, I think any steps toward freedom are good, and in a country like that, they will be small steps. Now, this morning, it’s coming out that Ahmadinejad has been declared the winner of the election. The results are highly contested and controversial. This was supposed to be a very close race, and it seems astounding that he would loose by such a huge margin, let alone in his own home town. People have taken to the streets in protest, and frankly, that’s a great thing to see in a country so tightly ruled. The Interior Ministry of the country has blocked communications, including text messaging, and pulled newspapers from the stands. So, we actually know more here, than the people in Iran do. Something is foul about all this, to be sure. It’s been a few weeks since I’ve posted anything. That’s because my world has been turned upside down. A little over four weeks ago, my dad passed away unexpectedly in his sleep. Ever since then, nothing has been the same. My dad was my rock. He was my friend. He was my daddy. He will always be. But I miss him terribly. He was such a huge part of our lives. I love my dad more than I could ever begin to describe. It’s been 4 weeks now, and I still feel lost and terribly sad. The sadness is purely selfish. I’m thrilled for him. I know where he is. I know that I’ll see him and be with him again. I know t hat death is not the end and that I can be with my family for eternity. However, I’m so sad not to have him physically here anymore. Someone told me that we never mourn for those that have passed, we mourn for those of us left behind. It’s so true. I wanted to take a little bit of time, and talk about my dad a bit. My dad’s world revolved around me and the kids. His family was his life. Growing up he always put me first and was always there for me when I needed him. There are countless examples of this, but I remember on one particular occasion, I was in preschool. Some kid slammed my pinkie in the hinge part of a door and I was in some serious pain. I remember getting some ice from the teacher, and then looking up and seeing my dad there. It seemed like it has only been a couple minutes since it had happened. My dad was at work at the time, but dropped everything and drove as fast as he could to come get me. On another occasion, he came to the rescue when I lost my favorite blankie. I have wonderful memories of going out to Lake Mead with my dad. No matter how much he wanted to fish, he always made sure to pull the boat up to shore line so I could go collect sea shells and rocks and other fun things. We spent a lot of time outdoors when I was younger, as my dad loved to fish and hunt and camp. We stayed close, even as I was a teenager. My dad was always someone I felt I could talk to and go to with anything. He wasn’t always happy about what I did, but he was always there for me and always loved me. After I got married and had children, my dad was a wonderful grandpa. Trips to grandpa’s house with the boys always started off by visiting the garage and playing with tools and learning something. He loved to have the boys come over and they would build things and work on all kinds of projects together. And the girls just melted his heart. In talking to family and friends, he would constantly be talking about the kids. He took such joy in all of them. He was a huge part of our lives. My dad was incredibly talented. As a young child I remember sitting next to him and watching him as he tied flies for fly fishing, or worked on a fishing rod, making it look completely amazing. He also was an extremely skilled woodturner. The things he made on that wood lathe were absolutely incredible, including intricate baby rattles for each of the kids. My dad was also the one anyone called if they wanted a picture frame made, or shelves made, or anything fixed. My dad was also a very kind and gentle man. He was a great example to everyone who knew him. I’m so grateful for the time I did have here with him, and I’m so grateful that he is my dad. I wanted to take a moment and talk about a wonderful friend of mine, Aimee, who passed away today, surrounded by family and friends, after loosing her battle with Cystic Fibrosis. She and I have been friends for about 13 years, after we met in high school. We’ve had some awesome times together, full of fun and laughter. But, with Aimee, it was always that way. She always had a smile. Aimee was one of the most warm and caring people I’ve ever known. She was usually more concerned about other people than herself, even when she was sick. Her heart was so big and full of love to give. Aimee was also a rebel and highly opinionated. She wasn’t afraid to tell you what she thought. But, I think that’s why she had so many people that loved her. 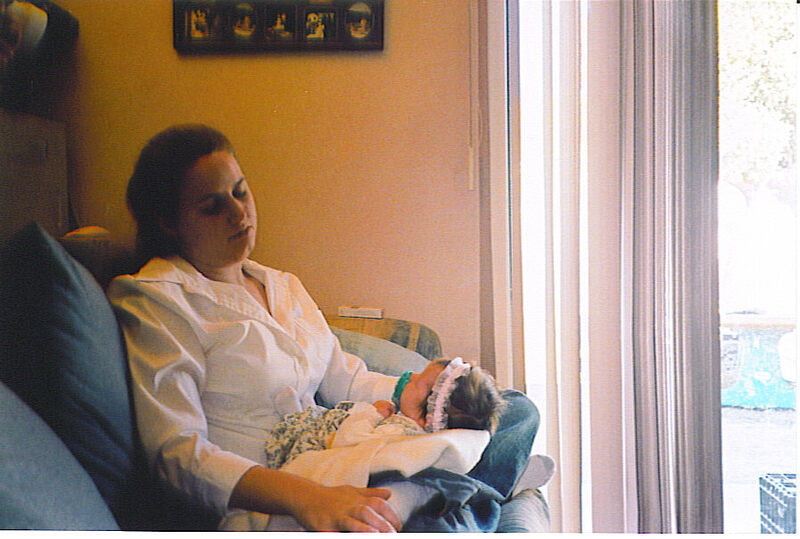 Aimee was an aunt to my children, and a dear, dear friend to me. She was also a wonderful daughter and sister, and to Aimee, her family was everything. While it saddens me to think of life without her here, I am comforted and delighted with the knowledge of where she is now, and the amazing memories I will carry with me forever. Mike also wrote about Aimee on his blog. You can read Aimee’s obituary here. It appears in the July 23 issue of the Las Vegas Review-Journal. 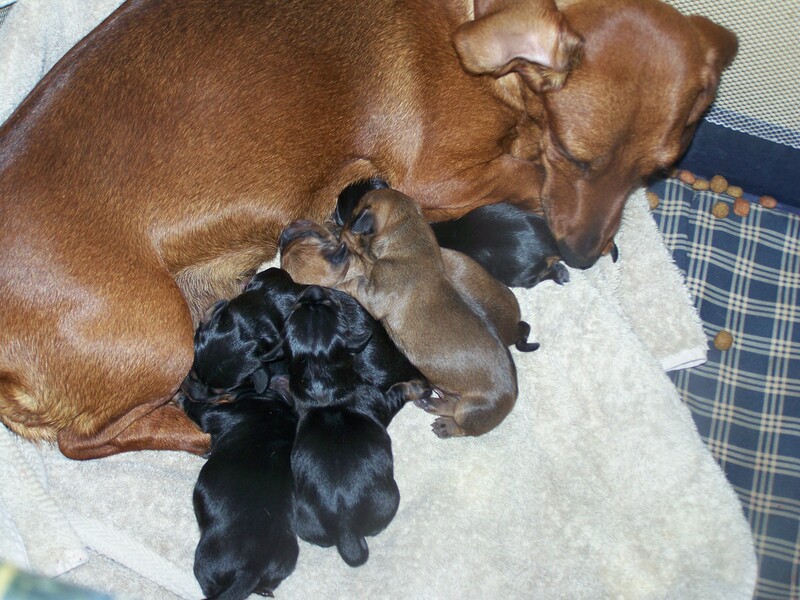 Literally, like 5 minutes after I finished my last post, Leia had her first puppy! She has since had all six! 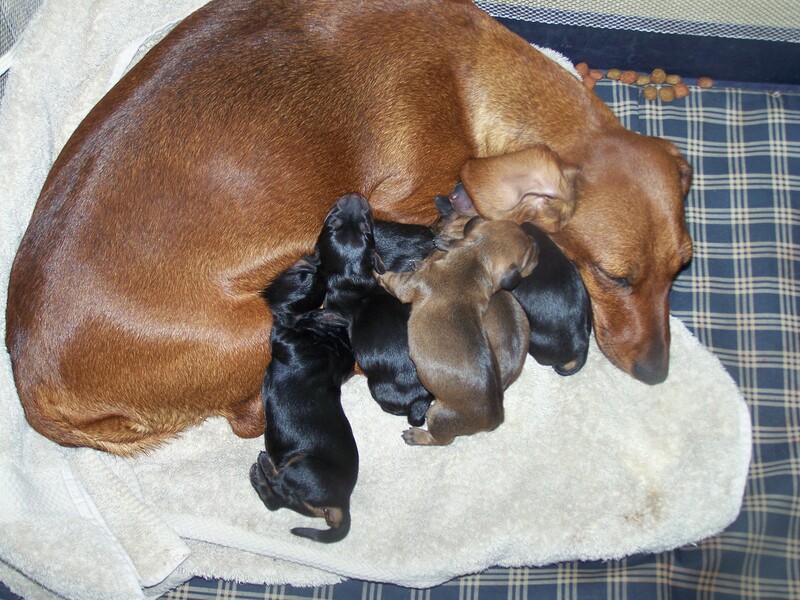 Yup, six pups! They are just adorable and precious. And, mom and babies seem to be doing well. 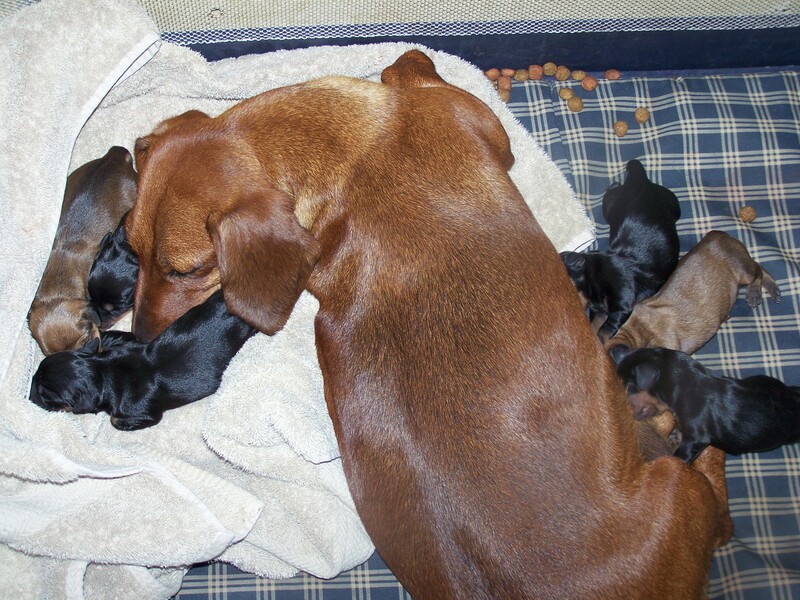 She had 3 boys and 3 girls; 2 brown/red and 4 black. Here’s some cute pictures! It’s been a while since I posted. It’s not that I don’t have anything to say; I’ve just been very busy. Of course, I have some commentary on recent political activity, but that will wait for another time. 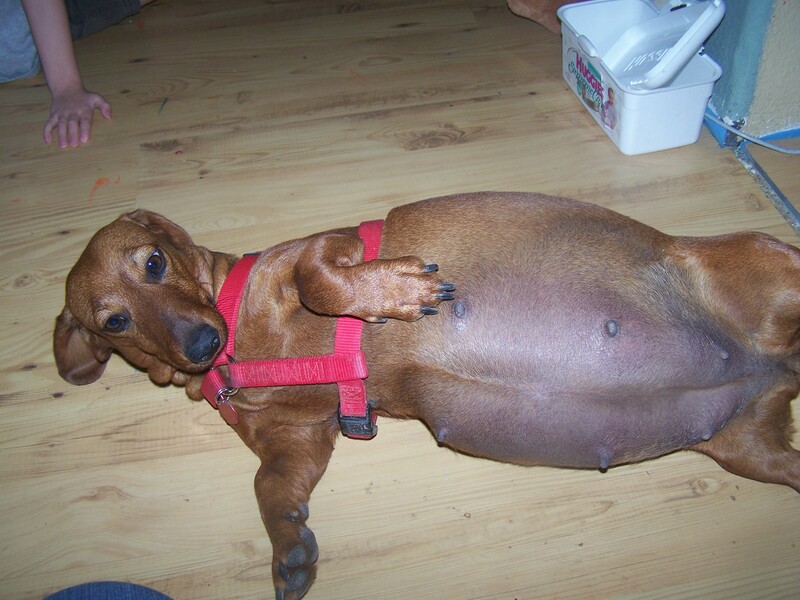 So, one of our dogs, Leia, is pregnant, ready to pop at any moment. She’s going to be a great mom; definitely has the disposition for it. So, we’ve been on labor watch for the last several days. I took her into the vet on Thursday, and they did an x-ray to make sure everything was ok. Everything looked good, and to my utter surprise, she has six little pups inside her belly! WOW! I seriously thought there were two or three. We haven’t told the kids how many, just in case they don’t all make it. But, I have had them guessing. So far, Gavin and Genevie both said seven, Logan guessed four then changed it to six, and Daphne says two. It’s been fun to watch them be so excited. I think I’ve been more anxious about this than Leia has. I keep thinking she’s going to have the babies, but then she doesn’t. She’s showing all the signs. But, the vet said today that she could start doing that up to 72 hours ahead of time. Hopefully, though, it will be soon, and everything will go well. Also, I’ve been covering my front yard with rocks, since we just couldn’t keep the grass alive. 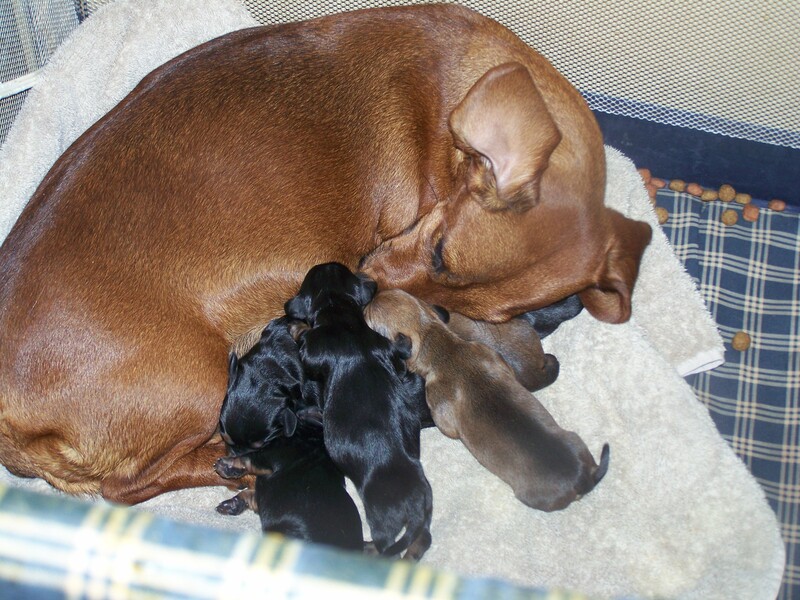 Well, I decided yesterday that I probably wasn’t going to be able to work on it much after the pups are born. So, I called two of my friends and they came over and we pretty much finished it. Hooray! Now, we don’t look like our house is going into foreclosure. It is really plain right now, but it looks much better. I think we’ll add some more plants and color once the temperature goes down again. I have to say, I’m truly grateful for such wonderful friends! A friend of mine recommended that a do a little post about a new blog I’ve started. As we have begun a new chapter in our family life, I decided to chronicle it all. I think it will be of great value to us later. I suppose it’s like a journal, much like this blog is. My father-in-law mentioned to be yesterday that I should print all this stuff out and put it in a binder. He’s probably right. For all practical purposes, these blogs really are my journal, at least for now. Anyway, check out the new blog. I love my kids! They truly are wonderful! I can’t believe the amount of joy they bring to me, on a daily basis. God sure knows what he’s doing with this whole family thing! It’s the best! The following are some pictures of my little ones, bringing huge smiles to my face! The boys were playing in the backyard for something like 3 hours the other day. They had a blast making and playing with mud. I mean, come on, what’s better than that? Life was good, and I just had to smile. Just complete and total joy for them. It’s awesome. (They are washable, after all.) I love it! Top to bottom: The boys both sitting in their mud puddle and smiling for the camera; Logan standing on the picnic table doing some kind of Tarzan thing; Gavin showing his happiness, and his dirt. Daphne and her best friend, Sydney, had a craft and play day. It was great fun. First a trip to the craft store, where great fun was had by all, then they got to color these nifty flowers and butterflies. They are so cute together, and they love spending time with each other! Top to bottom: Sydney taking a picture of Daphne; Daphne coloring her butterfly magnet; the girls working with their respective crafts. Genevie got a loom I use to make knit hats and somehow got her head through it. After that, it was stuck. I tried every which way I could to get it off, but we had to have Grandpa come cut it off with some super strong pliers. (I’m just glad we didn’t have to call the fire dept. to come get it off.) So, while we were waiting for Grandpa, I decided I might as well get a few pictures. So silly! Top to bottom: Up close of Genevie with the loom necklace, looking happy as can be; Genevie looking at a book while we waited; the loom after it was removed. Just a few miscellaneous pictures. The Lord has blessed me with the most wonderful family! I love them more than I can possibly express! How grateful I am that we have been sealed together forever! What more could I ask for? !